My Little Pony Equestria Girls: Rainbow Rocks finds Canterlot High (CHS) hosting a musical showcase, and Rainbow Dash, Applejack, Pinkie Pie, Rarity, and Fluttershy are going to be performing with their new band, The Rainbooms. But when The Dazzlings, a new girl group, arrive at CHS and convince everyone to turn the friendly showcase into a Battle of the Bands, tensions mount between the competing musical acts. A now-reformed Sunset Shimmer realizes that the Dazzlings may not be ordinary girls and are after something far more sinister than just being named Best Band at Canterlot High. The Rainbooms call on Princess Twilight to restore harmony to their world to help them perform a musical counter-spell so that they can win a battle that now determines the fate of the entire school! 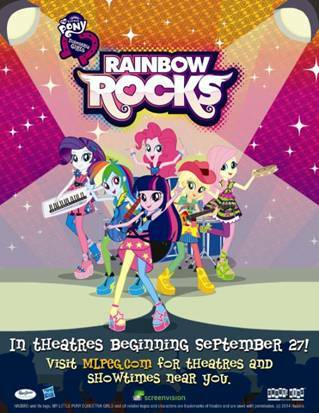 One lucky winner will receive a family pass of 4 to go see My Little Pony Rainbow Rocks at Cineplex on October 5th. We would go to Fairview!